Thank you! to all who have stopped by and an extra thank you to those who took the time to drop a line. A Gentleman's War meets NQSYW at Sittingbad. May your dice be blest in the year ahead. An excerpt from General Lannigan's unpublished manuscript "Fighting for Freedom" along with illustrations from an anonymous artist. 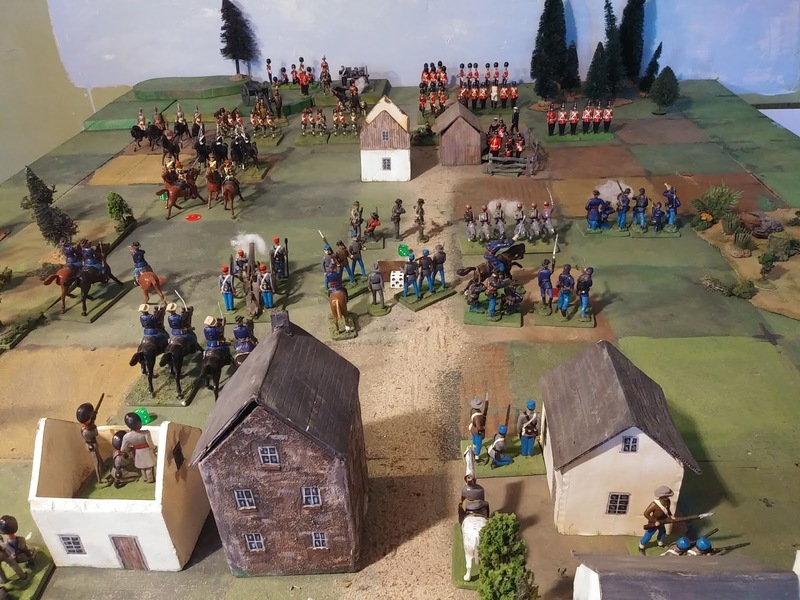 The Rebel army marches out to face the foe. "The retreat from Duck River was a bit of a shambles but I managed to pull the army together at the little town of Sittington on the banks of the fast flowing Blutaip River. 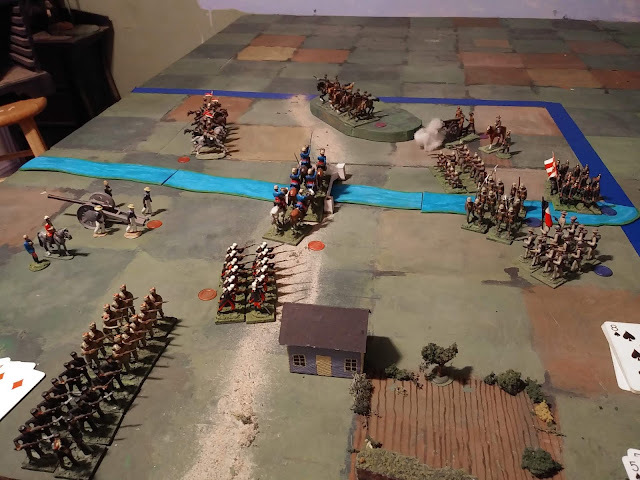 With the Red Queen's forces hot on our tail, the best plan seemed to be to cross over and then blow the bridge which was the only crossing point within 50 squares for an army with all of its supplies. Before I could issue the orders though, word came that the army's supplies had not yet been evacuated from the depot in Sittington as ordered. Those supplies were crucial for the continued existence of the Rebel army and so I had no choice but to order the men to prepare for battle. We had to buy time to evacuate the vital munitions. 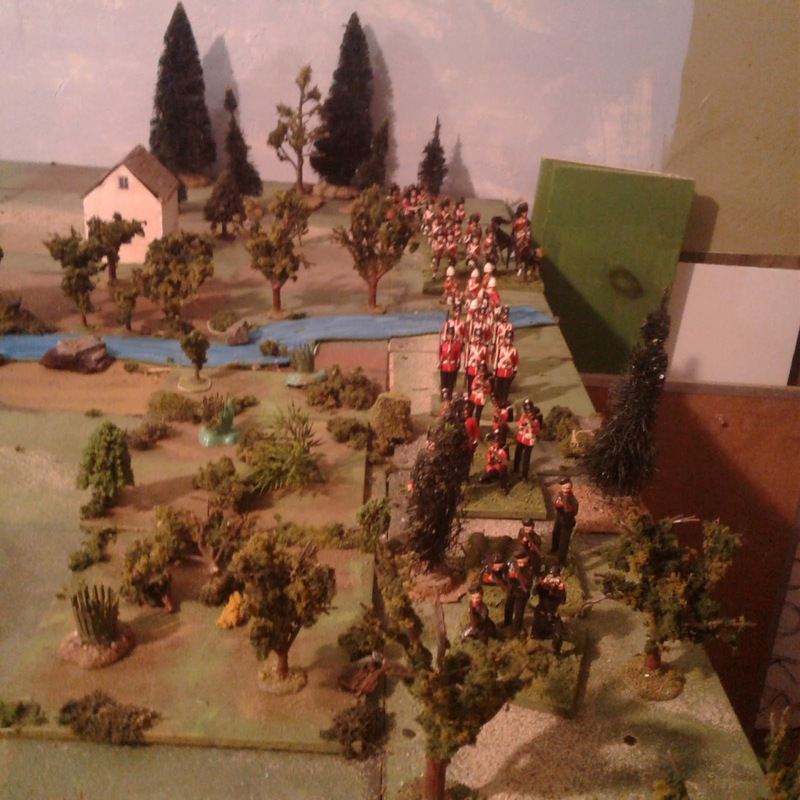 McAlpine's Fusiliers get to work with axe and shovel on some field fortifications as the advance guard pulls back. In the morning there seemed to be a never ending stream of redcoats pouring on to the field. It was obvious that they had been heavily reinforced since Duck River. We had a narrow gap to hold and that would make it hard for the enemy to use his superior numbers, so it was possible. A probe by enemy Hussars was quickly driven back . As the army deployed, McAlpine and his pioneers were soon busy erecting a hasty redoubt in the centre to make the position even stronger. 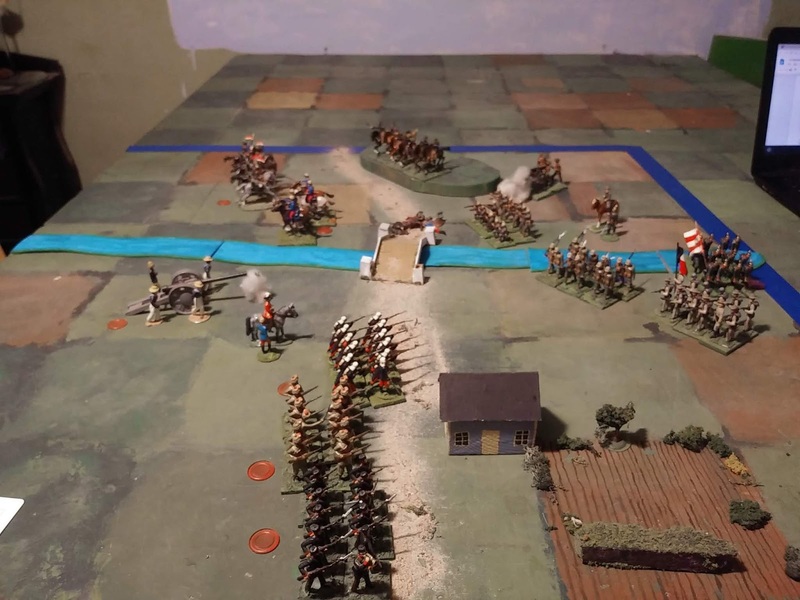 With the main army deployed, I ordered the sharpshooters to pullback from LIttle Farmton and move to the left to keep the enemy from moving through the woods and recalled the 3rd Infantry to the main defence line. 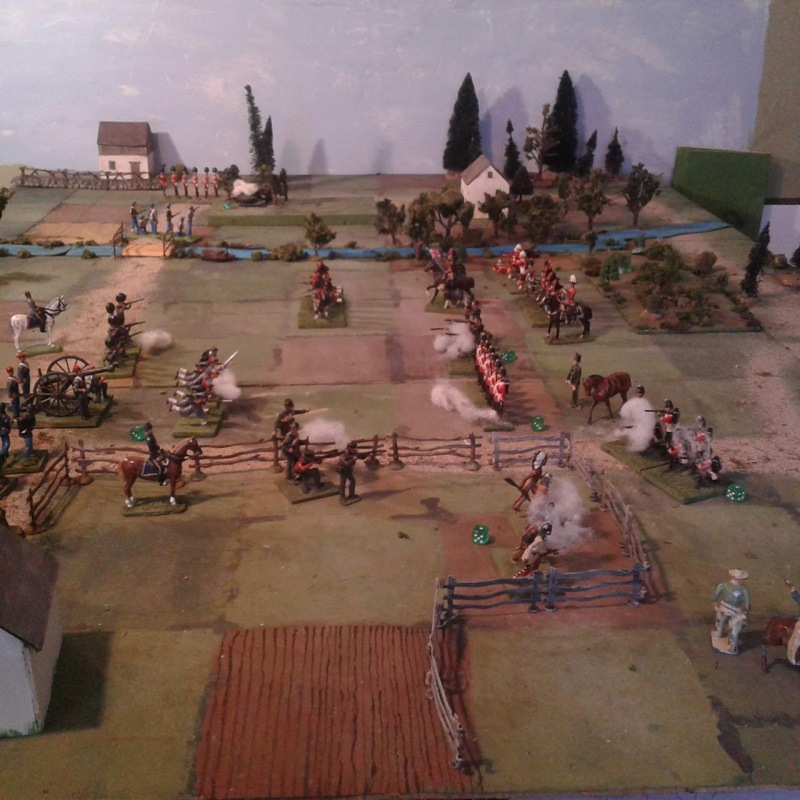 The Redcoats have passed through Little Farmington and opened fire on the main line. The first enemy assault on our mainline was repulsed easily at all points. There was a pause while they brought up guns and reserves but things were looking good. A hole in the line! Where are the reserves? Things were fine until our only battery was silenced by massed batteries and rifle fire. I could see the Highlanders preparing to charge and so ordered the battery to fallback and the Chasseurs to come forward to fill the gap. The line is under heavy pressure. It was too late. 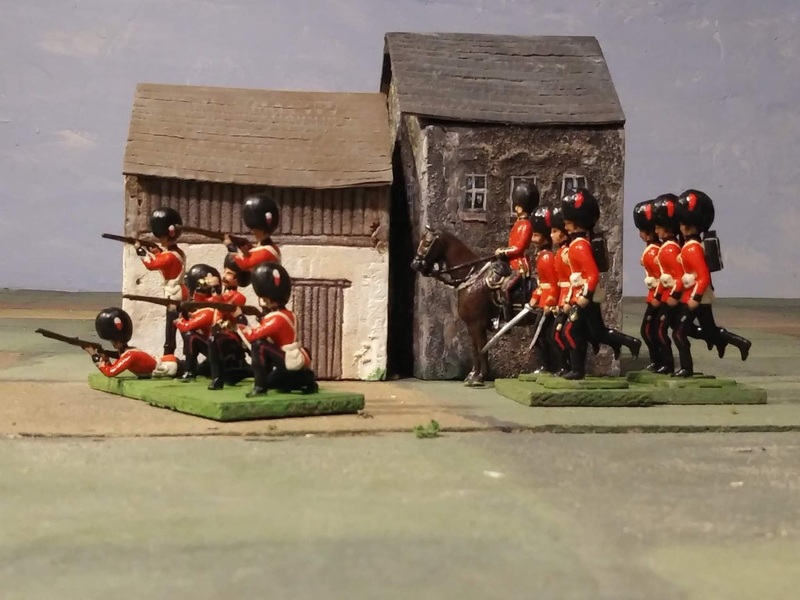 The enemy's Foot Guards had driven the Sharpshooters from the wood and the redoubt was under heavy pressure with no reserves close enough to intervene. The redoubt is over run but McAlpine's falls back in good order. 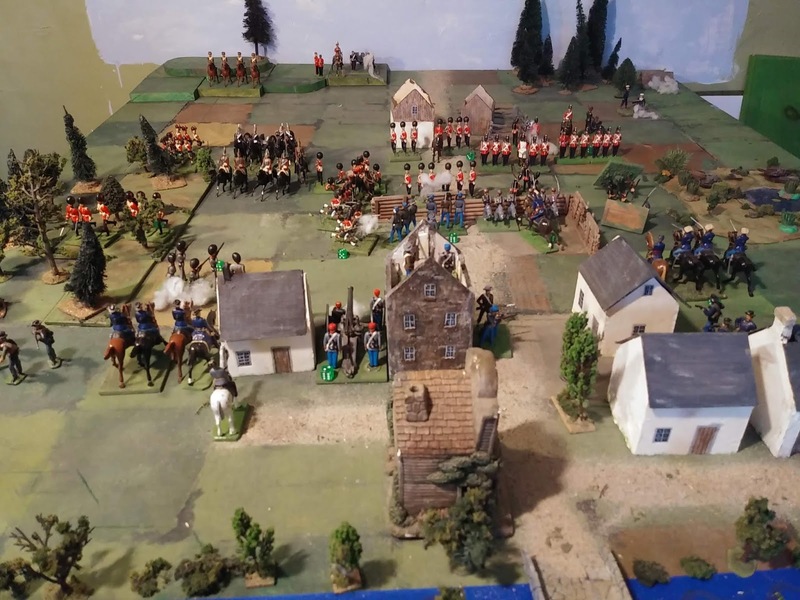 There was no option but to pull back as quickly as possible and hold the town as the last line of defence. Thankfully the Commissary now reported that the stores had been successfully evacuated. All that remained was to save as much of our force as possible then blow the bridge. Mcalpine's falls back over the bridge. For a moment it looked good but our luck had turned and the enemy's cavalry was on us in a flash. 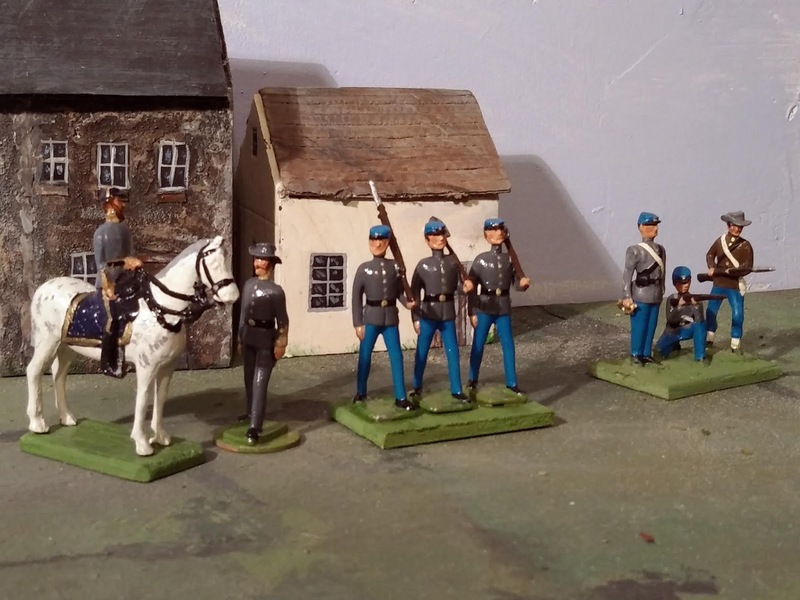 The Black Horse were scattered, the battery over run and the Sharpshooters ridden down. There was no way to save the last two infantry units. As the Zouaves fell back over the bridge I gave the order to light the fuse. There was a flash then a terrific BOOM! When the smoke cleared the bridge was still there but it looked mighty shaky. Men might cross it slowly in small parties but no cavalry or guns. It was enough, but we no longer had an army in being. The retreat continued all that night." Since some lazy sod has been watching movies and eating instead of typing, the battle report is not quite finished. Should be available for the Sunday papers. They are one of 4 Canadian units, (1 regular, 3 primary reserve) authorized to wear bearskins. The Royal Grenadiers (as they were) wear a white over red plume and the standard infantry pointed cuff. The Vandoos or Royal 22ieme, a regular regiment, (3 wear a similar tunic but with red plumes on their bearskins. The Grenadier Guards (the oldest regiment) wear white plumes and the old slashed cuffs as do the Governor General Foot Guards (the senior regiment as opposed to oldest) who wear red plumes. 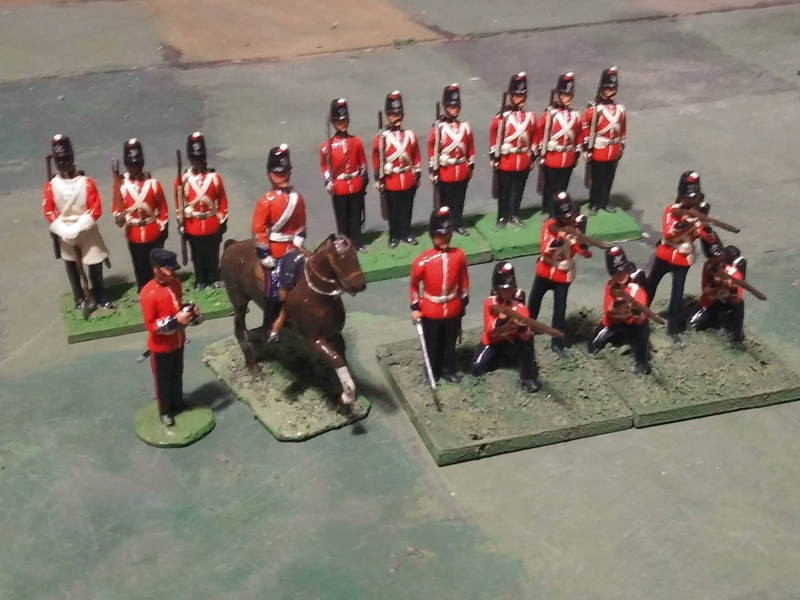 As one would expect very similar regiments may be found in the Faraway Royal Army. The game began this morning and I managed 6 turns before Social 'duties' called. Boxing Day, time to take the gloves off and play a game! 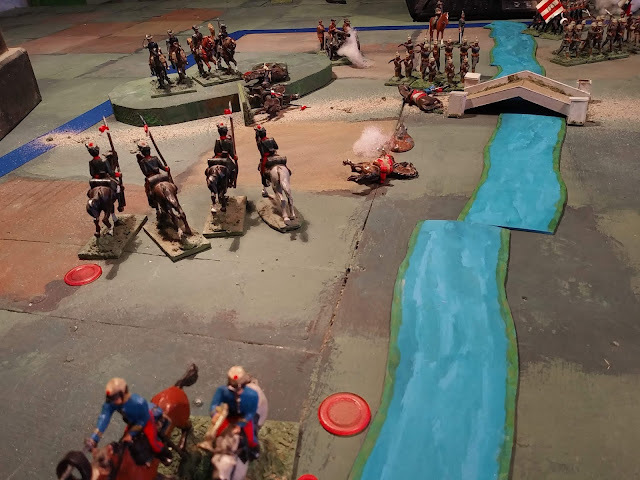 Old School scenario, older toy soldiers, contemporary rules. I wanted a scenario where some of my new sappers would have a chance to build some entrenchments and/or blow a bridge. Didn't take long for one to come to mind. 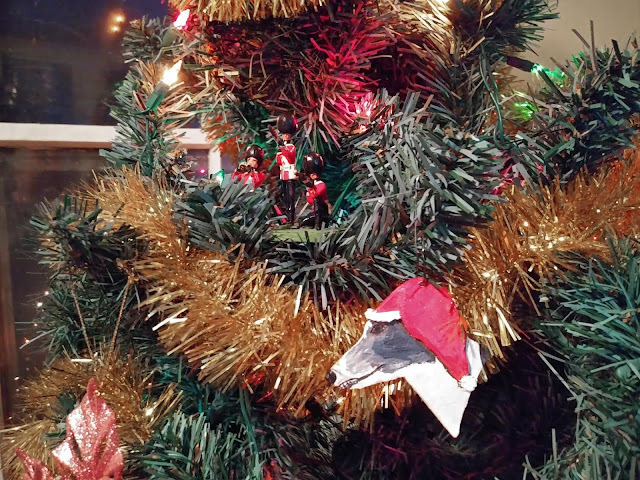 May the Season be filled with peace, good food shared with friends and family, kindness to strangers and friends alike, and....... some SHINY TOYS! 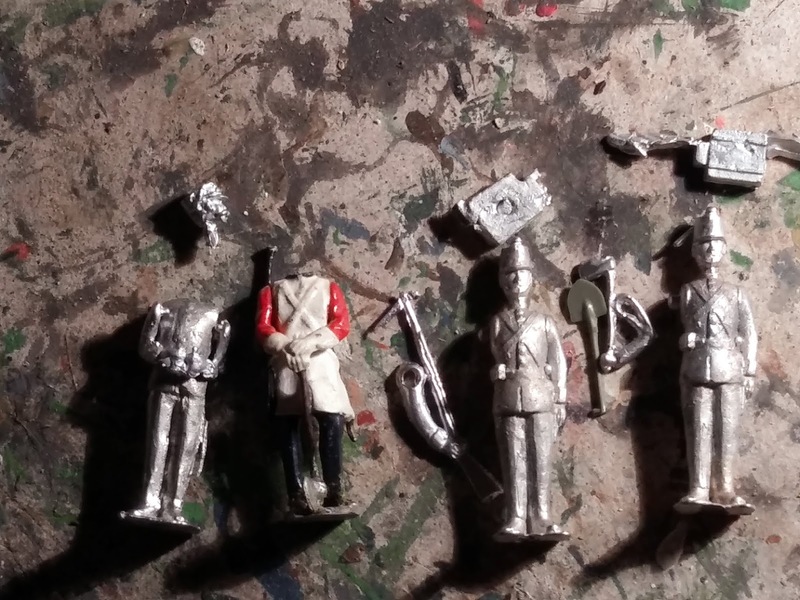 For the curious, here is what 90 year old Britains Toy Soldier guardsmen look like after they have spent an hour in Natura Safe Strip followed by a quick rinse. Amazing sometimes what details emerge from under a thick coat of gloss enamel. Is there a competition for messiest work desk? Don't worry the Old Soldiers already have their undercoat on so they don't catch cold. Well, after a lengthy debate in Parliament about the wisdom of allowing 3 figure Pioneer companies and whether or not this proposal was part of a plot to secretly rewrite the defence policy, raise 12 man battalions for field service and force a change in the international rules that govern how war is conducted on the battle table, the matter has been settled. 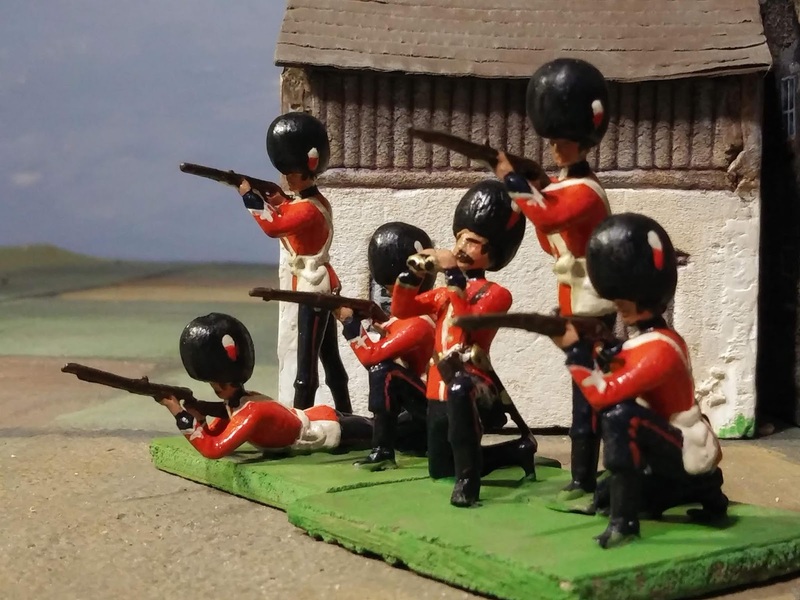 Henceforth, all 54mm pioneer companies are to adhere to agreed upon international infantry standards with 6 figures including an officer, NCO or musician and such companies are to be considered as standard infantry when not engaged in specialist tasks. 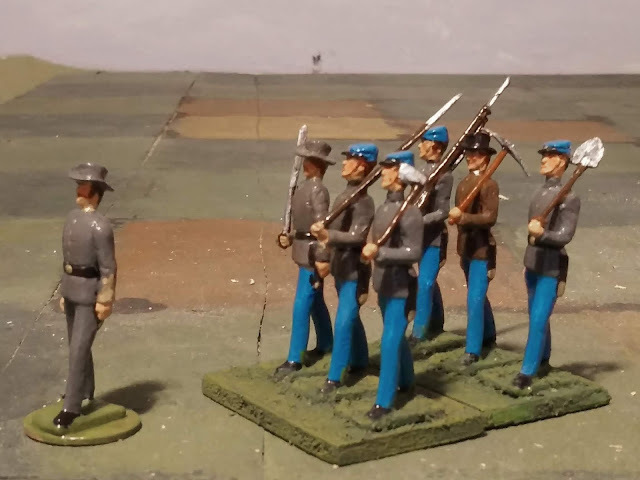 And so it is that my pioneer units have now been boosted to standard infantry ''company" size with 6 figures and various rule changes and complications have been averted. 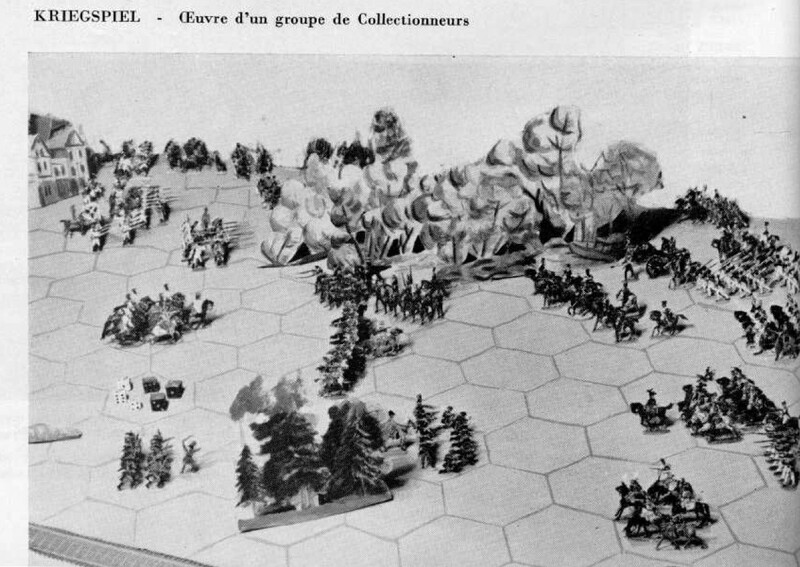 Today I followed a FB link to a great article about a group of miniature wargaming enthusiasts in Paris in the 1930s and 40's. These were not just gentlemen of leisure but included soldiers, artists, historians and others, many of whom played their part in the Resistance even while the games continued. 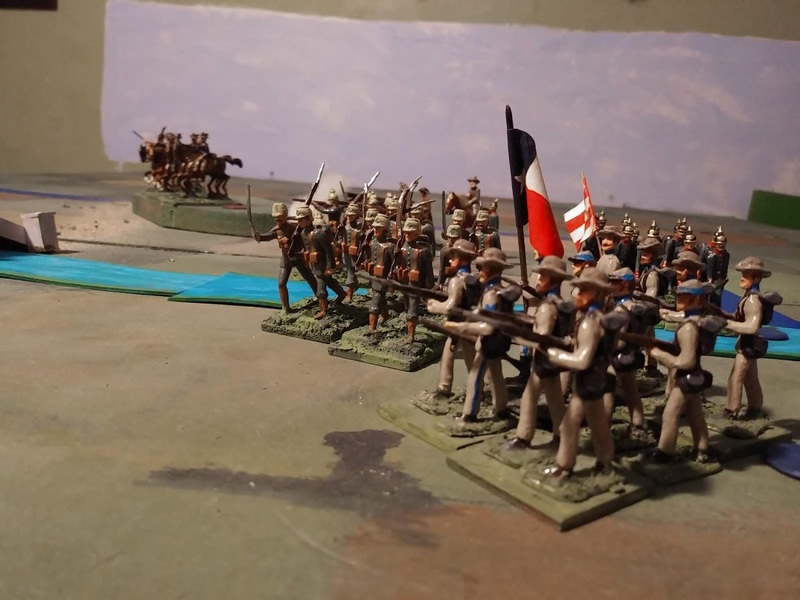 The article is well worth reading for anyone with an interest in the history of wargaming, the influence of French miniature wargaming on early US wargaming, or real life stories of brave men. This seemed like a good time to finish a proper commander for the Fort Henry Guard. 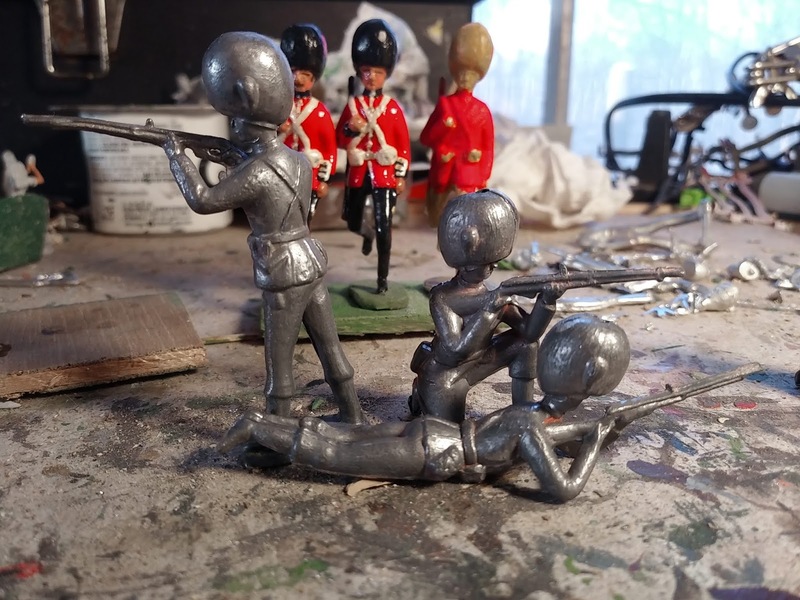 This figure began life as a Trooper in the Life Guards. Somewhere around 1971, a youthful me converted him into a 1900 Canadian infantry officer in dress white spiked helmet based on an illustration in a book. More recently he has served on the tabletop as Colonel Marten but the helmet style just didn't fit so I decided that it should be replaced. 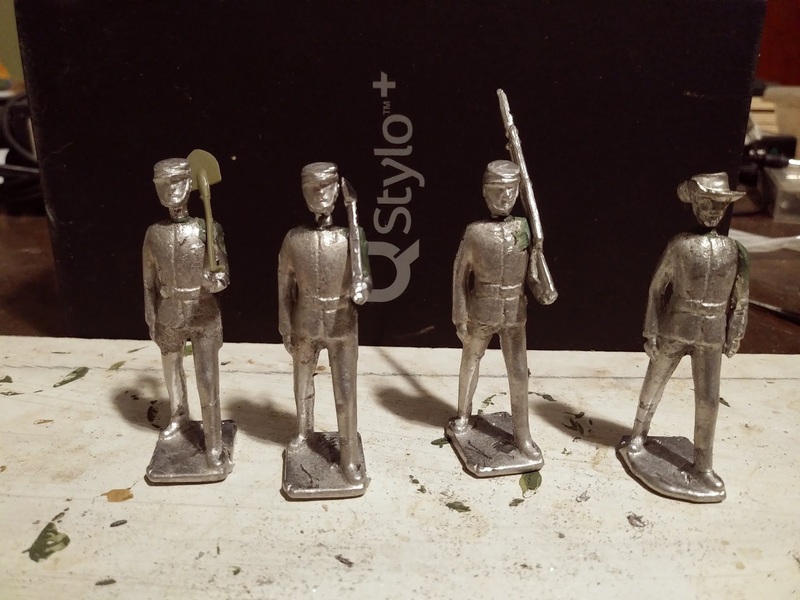 I wanted to keep as much of his nearly 50 yr old repaint as possible so just swapped his plastic Eyes Right helmet for a homecast FHG Shako and repainted his lace silver instead of gold. A new head warrants a new name and so henceforth he shall be known as Colonel Ross. This unit is in honour of the thousands of Black Canadians who have volunteered and served over 3 centuries. I have previously mentioned P.O. William Hall VC who was born and buried across the Avon River from where I live but there have been many more. Pioneers stand by as the new Officer of Engineers ponders what to do. During the first half of the 19th C Black volunteers were particularly useful for border guards as British troops tended to contain too high a perecentage of men who were attracted by the prospect of life in the US. This was much less attractive to men who ancestors had arrived in Canada as Loyalists and/or escaped slaves. The Black volunteers also tended to be used to hard labour and performed as well with axe and shovel as they did with rifle and musket. 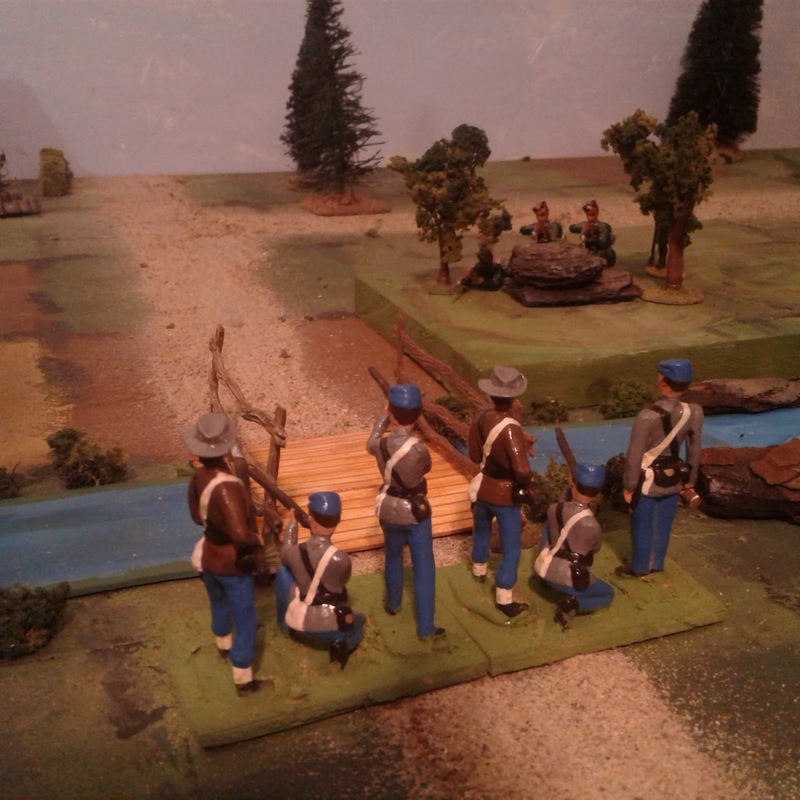 This unit was inspired by the Black Pioneer Company raised in York County in New Brunswick at the time of the Aroostook ''War". Black Pioneer units remained a feature of the Canadian Army right up to the end of WWI. By WWII all units were integrated. 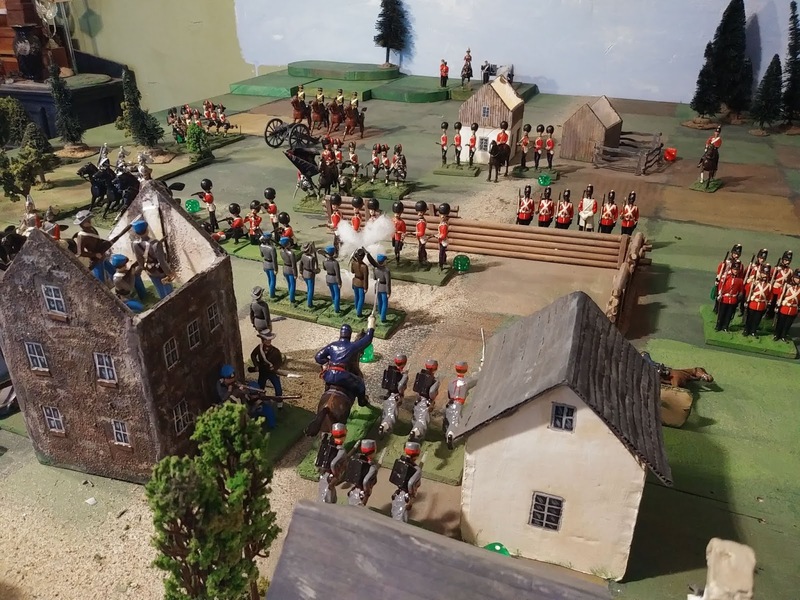 The heat of the Winter sun brings War to Oerberg! The Railway Battalion closes on the enemy. We have received the following dispatch from Oerberg where Her Majesty's forces have clashed with those of the Republic of Oerberg. 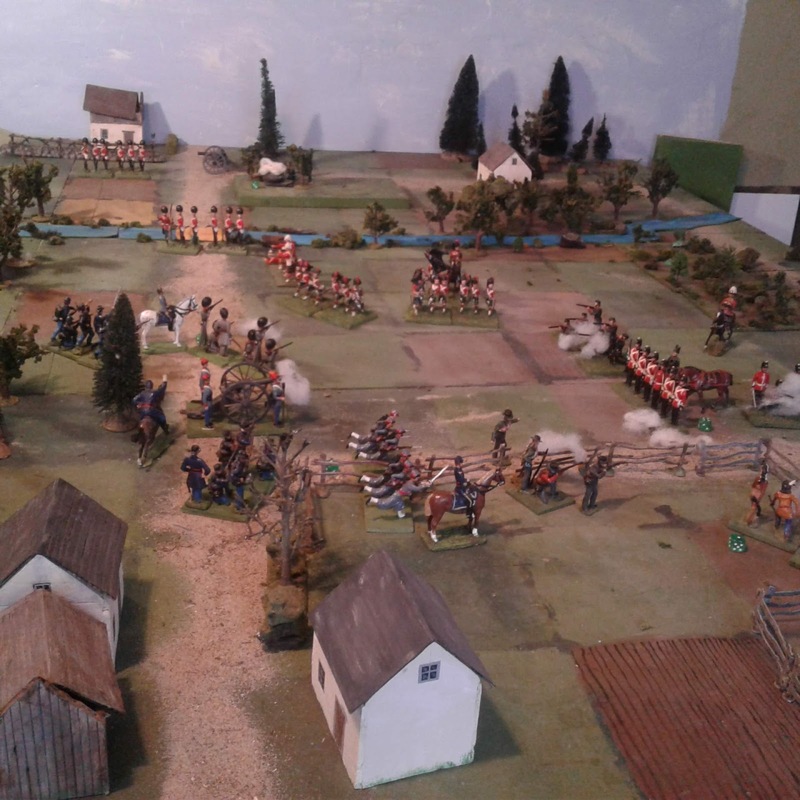 The sudden incursion of foreign troops onto the hot dusty Oerberg plain came as a complete surprise to all, however, the advanced state of the National Railway allowed a force to be quickly thrown forward to stop the enemy from crossing the Little Phoam River at Blasthof. Faraway or Allied troops under Cornberg to the left. This force, consisting of the Railway Battalion, 3 battalions of Foreign Volunteers and a squadron of the Frontier Constabulary backed by Long Li, was under the command of Field Commandant Willie Soubise, the spitting image of his uncle, Old Cords himself. The foreign invaders appeared to be a coalition force of Faraway and Hougal troops under the command of Major-General Cornberg wearing the Queen's uniform. The usual suspects were present, a Naval Landing party with a 4.7", a squadron of Larsen's Lancers and a battalion of Ross's Rifles but they were backed by a Battalion of Victoria Rifles, a battalion of Hougal's Foreign Legion and a squadron of their Chasseurs. 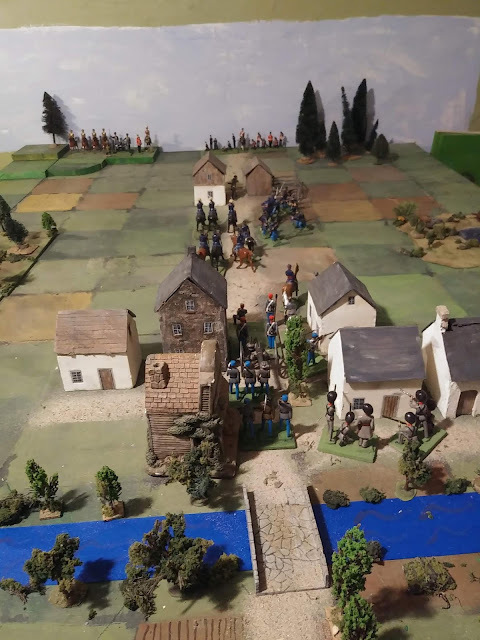 General Cornberg seemed to be driving them hard in an attempt to secure the bridge and they did not slow down at the appearance of the Oerberg forces. Soubise on the other hand appeared to have frozen at the sight of the enemy although he later explained that the halt as part of his clever plan to deceive the enemy and draw them forward into a trap. The silence, broken only by the thunder of hooves and blaring of bugles, was uncanny. 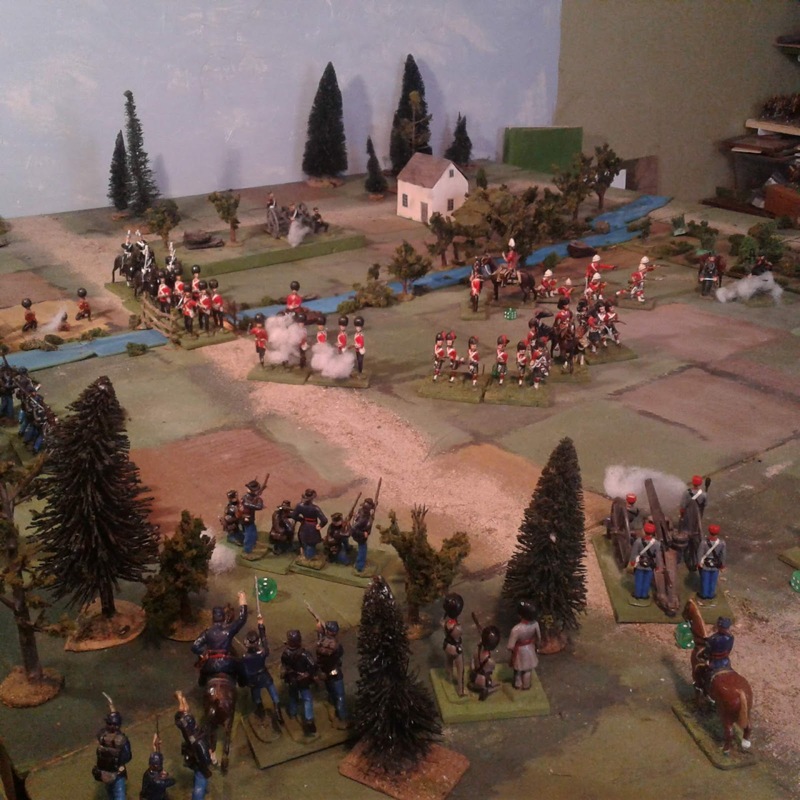 However, as the Chasseurs thundered over the bridge, Soubise nodded and the Oerberg gunners sprang into actions. At the second salvo from Long Li, the Chasseurs scattered and fled towards the Lancers leaving dead and wounded men and horses behind. It was like something I'd read long ago, at any rate the bugles sounded Charge! and my eye was drawn back to the battle. Soubise now sent his infantry fording the shallow river to hold the Northern edge of the bridge while the gun and constabulary held the Southern edge, from a safe distance. Another lull ensued with the 4.7" apparently stuck in the mud with the sailors heartedly wishing that they had been allowed to confiscate some ox teams while the the infantry of both sides trudged slowly forward and the allied cavalry rallied and formed up for a brigade charge on the Constabulary who had occupied a low hill overlooking the bridge. Soon enough the infantry on both sides were deployed and the rattle of rifle fire dominated the field, punctuated by an occasional BOOM from the guns. It was rather curious that though both sides had a strong interest in holding the bridge, neither appeared to send any troops to seize it. While Cornberg seemed too eager to close with the enemy to worry about objectives beyond destroying the ememy, Soubise just appeared happy to survive and hope the enemy went away. Eager as always to be at the enemy, Cornberg managed to push his battalions forward one at a time, later claiming that the terrain was less open than it looked and that there were communication problems due to the lack of translators. This later was curious as the Foreign Legion is well known for its ability to find someone in its ranks to speak any language known in Atlantica. 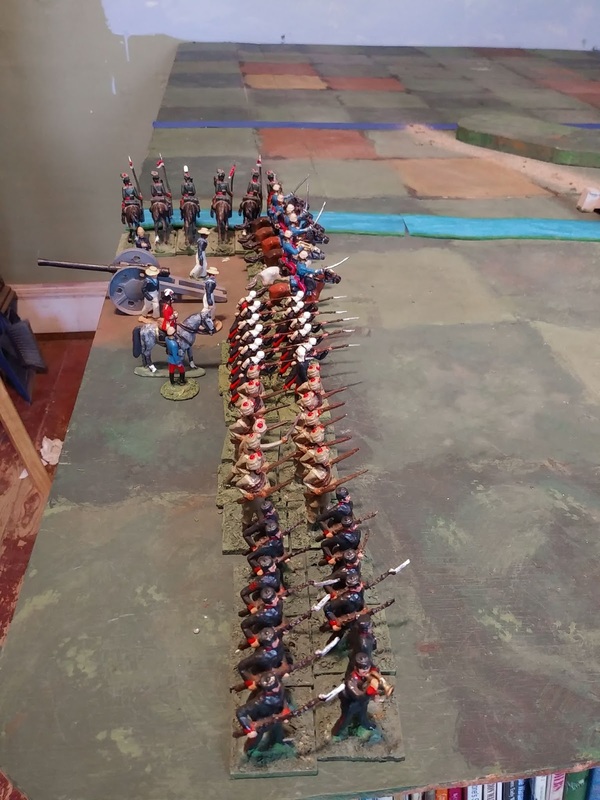 The Foreign Legion advances to the rear through Ross's Rifles. At last Cornberg could stand it no longer and ordered his cavalry to drive the enemy off the ridge forthwith. 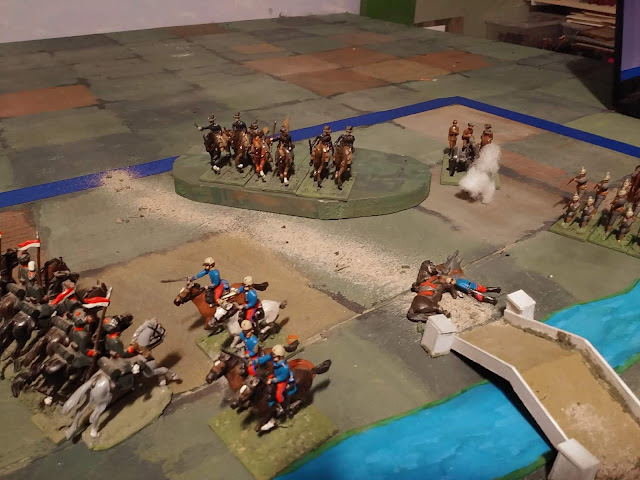 The Chasseurs, hit by intense artillery fire as they formed for the charge, could take no more and the last man was seen scampering from the field but the Lancers spurred uphill and fought the enemy to a draw. Falling back to reform for another charge, they also were caught by Long Li, which the gunners were slowly dragging forward, and reduced to a mere handful. The repulse of the Allied cavalry. The result was inevitable with battalion after battalion falling back in disorder before rallying while the Oerberg line slowly followed up maintaining a tight formation. When Ross's Rifles crumbled, Cornberg acknowledged the growing hopelessness of the situation and signalled for a general retreat. Even the passive Soubise could not fail to secure the bridge without opposition. We have been endeavouring to find out more but apparently our correspondent has decided to take a short sea voyage for his health. What we have ascertained is that there were no fatalities amongst the casualties who are all being well looked after, it seems it was indeed a Gentleman's War. A treatise on how small wars should be fought by well known adventurer Howard Whitehouse. 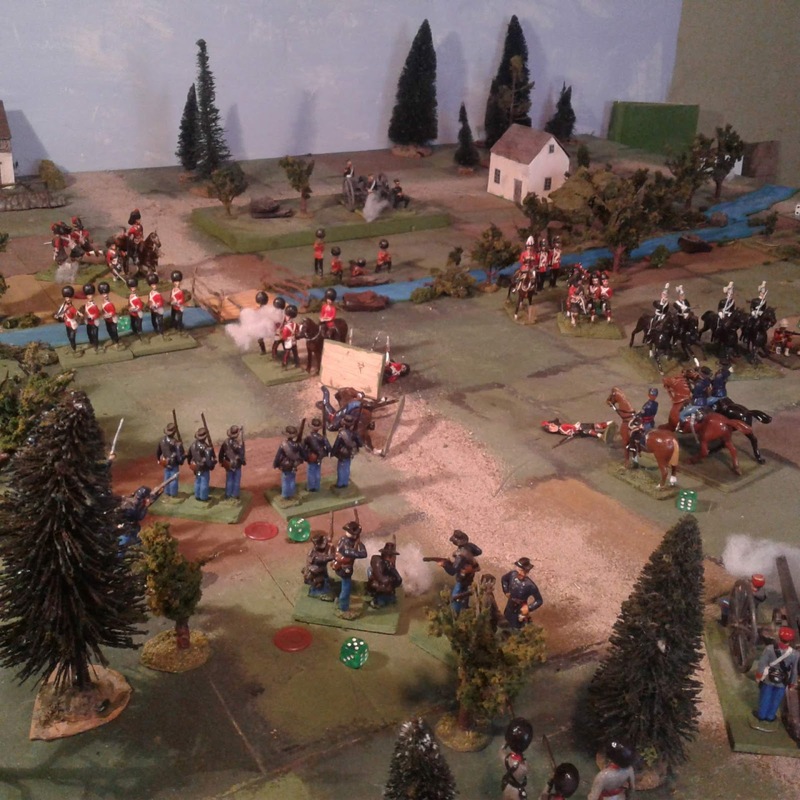 Its been two years now since I played Howard Whitehouse's "A Gentleman's War" at Fall In!. Since then I've had the pleasure of expressing opinions etc on line but despite good intentions had not actually gotten around to playing a test game at home. I'll skip the long list of excuses and just say that I finally realized that I had figures I could use by a quick melding of small units and set to. I wanted a small, trusted, scenario, Blasthof Bridge came immediately to mind. For reasons that have nothing to do with the rules, I decided to try laying with 1/2 ranges on a 3ft x 3ft playing area. 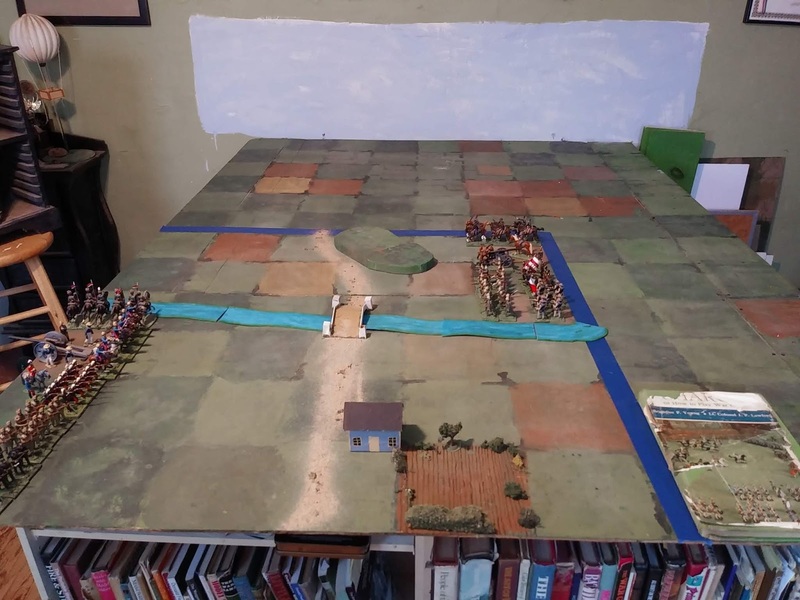 The layout: Faraway with some Hougal auxiliaries as the Imperial forces on the near side of the river, Oerberg with some Foreign "Volunteers" from Oberhilse as the Elector's army on the Farside of the river. The basic rules are fairly traditional, I won't use the term Old School as I no longer know what that means. They are not strict on organization but typical units are battalions of 12 infantry, regiments of 6 cavalry and one gun batteries. I did my best translation of the original forces to this format and followed Soubise and Kornberg's plans and have been trying to role play their personalities. The sequence of play is card driven with variable length moves based on rolling a number of dice like TS&TF and MacDuff to the Frontier etc however the card activation has a number of twists that introduce a second level to the game. Certain cards have special abilities, group moves etc while a hand of "Hold" cards can be used to allow reactions or extra moves and so on. Above all, Jokers trigger various special events and their appearance is the closest thing to "a turn". Combat is by rolling 1 die per X figures needing N to hit depending on range and other modifiers followed by saving throws and sometimes a morale check. Special unit characteristics add all sorts of tweaks which I'm skipping for now for simplicity. Where the game paused for the night. After about an hour of playing and looking things up, I had to stop for the night. The Queen's cavalry have just crossed the bridge and, as in the original game, have been hard hit by the enemy artillery. A link on FB to a youtube video led me to another video.... 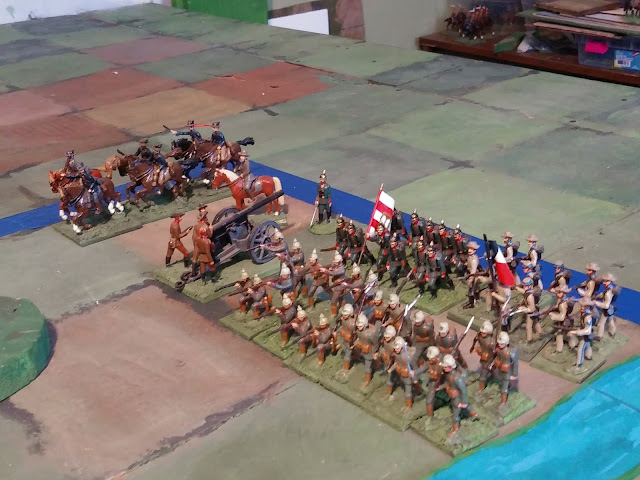 I don't speak Hungarian or Romanian but I do speak movie clips about mid-19thC battles. I love the bugler, movie character or historical heroine? Here is the latest Irish unit to join the Rebel camp, a unit of Pioneers/Sappers calling themselves "McAlpine's Fusiliers". Major McAlpine and his company of Sappers. I was torn between sticking with the plan of simple Britain's style toy soldiers in neat and tidy uniforms or a more realistic Ragged Reb look with battered slouch hats and blanket rolls using my "looks like Imrie Risley copies to me" moulds and no two figures dressed the same but in the end I decided to stay on track. I turned to the Miniature Moulds copy of a British Guards Pioneer with a head swap. One figure swapped his axe for an Airfix shovel and another was given a rifle to remind folks that these pioneers are armed and can fight. I also included an Engineer who is marching with the men instead of reading a map or similar. 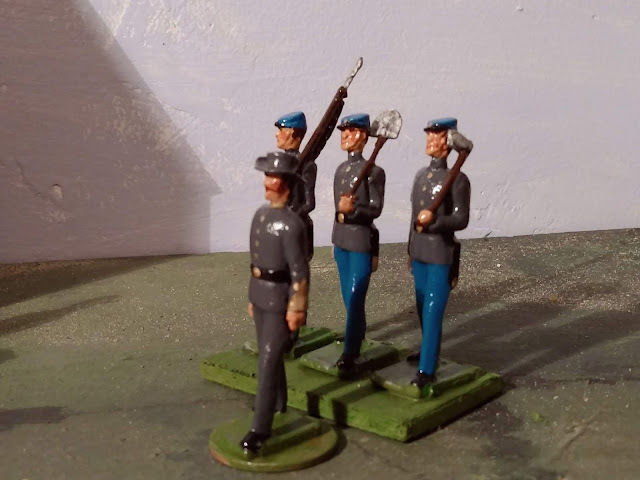 Originally I intended to base them on two bases each with two figures like I have done with Irregular sharpshooters but since the Sappers fight like infantry when not undertaking specialist chores like building or blowing up bridges, I decided to base the three sappers like infantry with the engineering officer mounted separately as a character. The original McAlpine's Fusiliers were, of course, not a military unit but merely a sarcastic nickname for Irish navies working for Sir Robert McAlpine's company on various construction projects in England. Hard work, poor pay and living conditions but better than nothing. Mine will live a life of luxury in comparison, especially since I roll dice instead of shooting at my toy soldiers. Where do you want him Doc? This lot has been improperly stored for most of the century and it seemed like time to resurrect them. The Medical Officer is a Miniature Molds homecast US Zouave officer paint conversion, the rest are recast Britain's from SoldierPac. 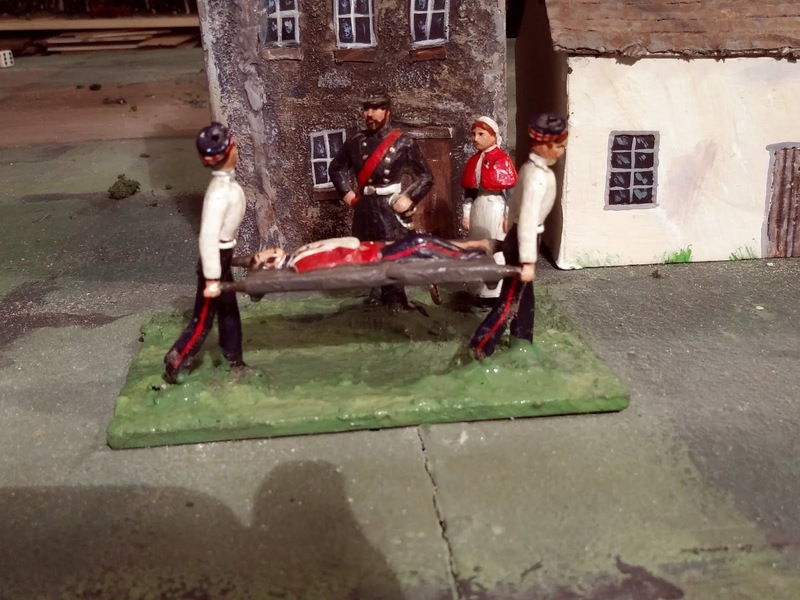 They've been rebased a la mode du jour and Nurse Little who had had surgery to help her fit better with 40mm troops has again had surgery to restore her to her original 54mm status. 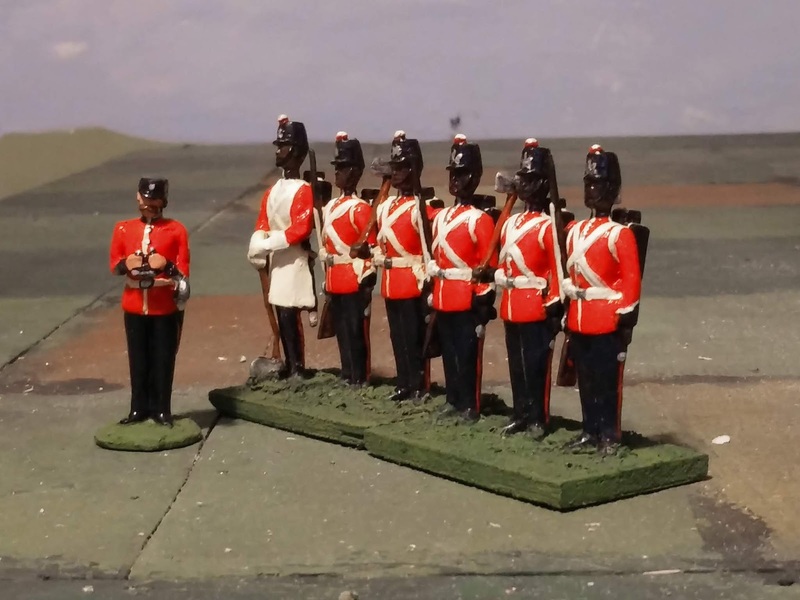 Next up, some brand new figures: a company of McAlpine's Fusiliers followed by a Rebel Aid Station and the Pioneer Company of New Brunswick's York Regiment which was largely recruited from African-Canadians. 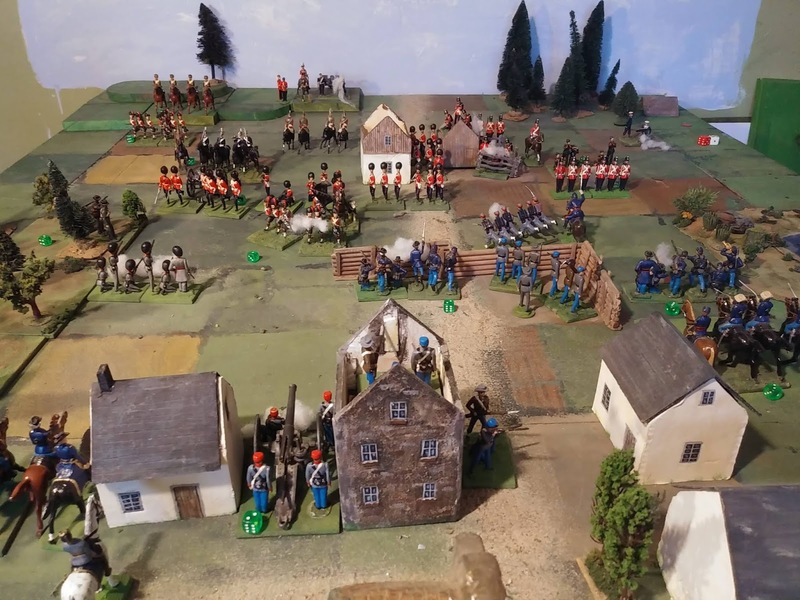 Local Irregulars gather to oppose the Queen's men. After the repulse of their latest probe, the Rebels had fallen back to the Duck River to regroup. There is only one bridge over the Duck and the marshy banks are not feasible for an attacking army. It appeared to be a strong position so a flank march was called for. 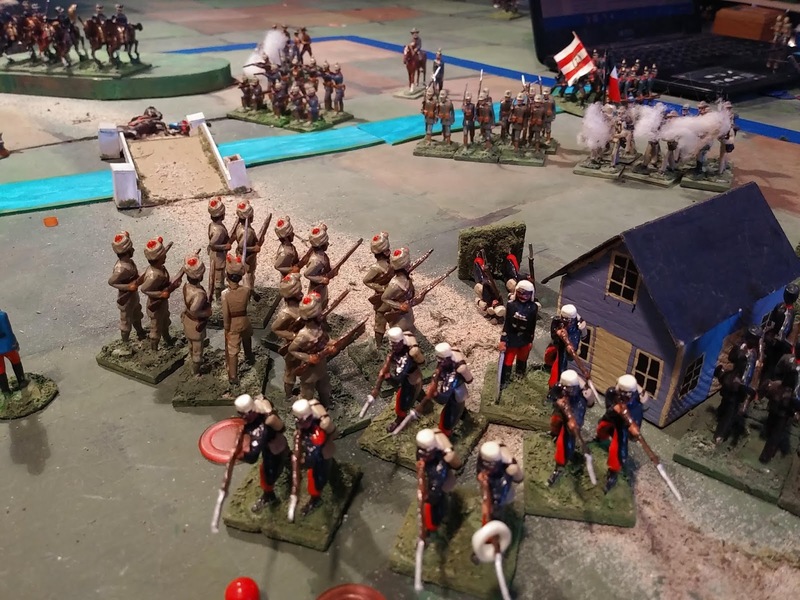 The Grey Zouaves throw themselves onto the enemy but at heavy cost. Hopes that the enemy might be caught napping proved false. 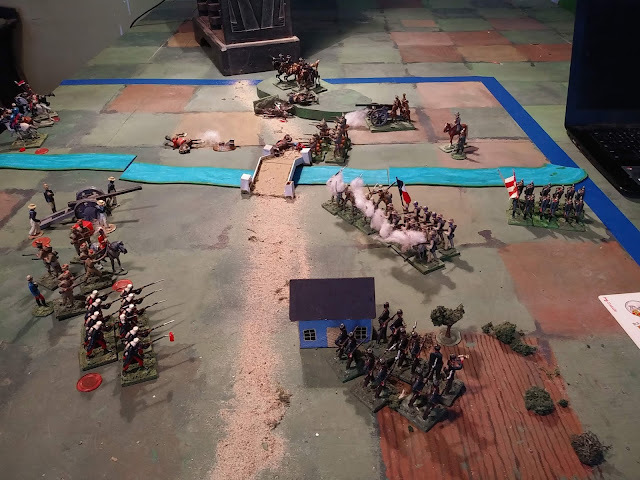 As the flanking column emerged from the woods and began to form for the attack, they came under fire from local rebel Sharpshooters and columns of Rebel infantry could be seen pouring onto the battlefield. 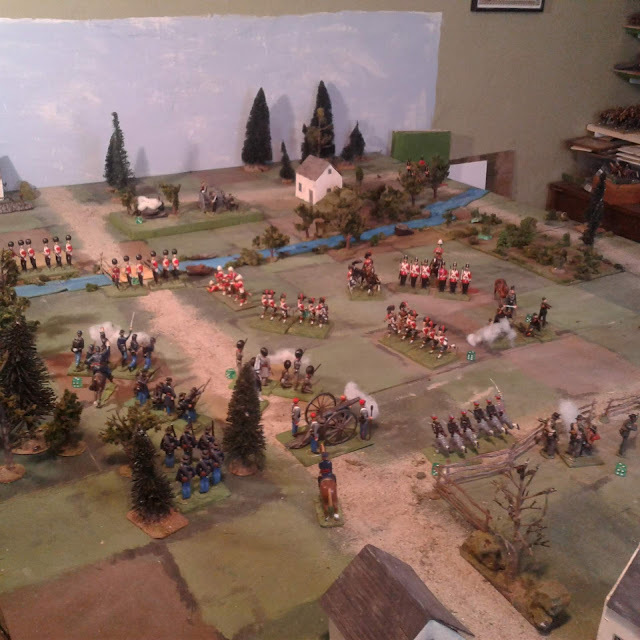 The Rebel forces quickly began a series of disjointed counter attacks and sent a company over the bridge to clear off the Glooscap Rifles. The Fusiliers were nowhere in sight and so, under heavy pressure from enemy sharpshooters and artillery, Douglas was forced to pull back his left and start sidling towards the bridge. At last the Fusiliers arrived and retook the bridge with their bayonets. Rebel reinforcements continued to arrive and General Lannigan sent them forward through the woods on his left to unleash a hot fire on our men. Fierce firefight on the banks of the Duck. 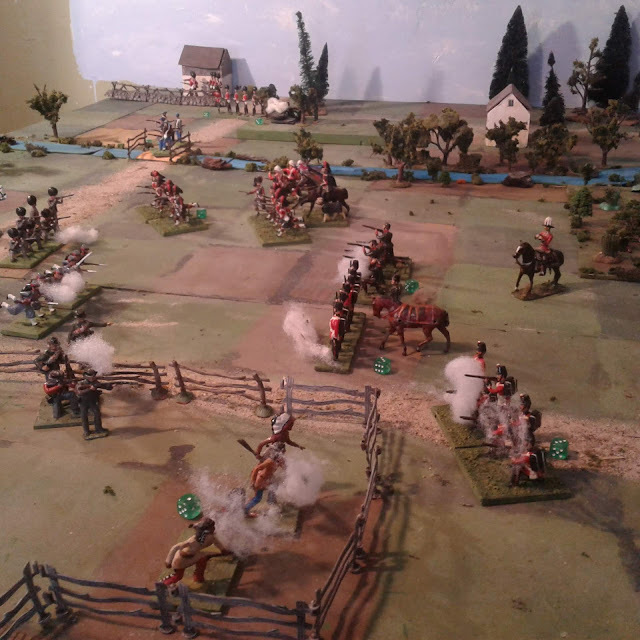 At last 'A' Battery was in position and their hot fire held back the enemy sharpshooters while the Fusiliers pushed over the bridge leaving the two companies of sharpshooters firing in support at any Rebel who showed himself in the woods. "Forward men!" Reinforcement rush to join the fight. 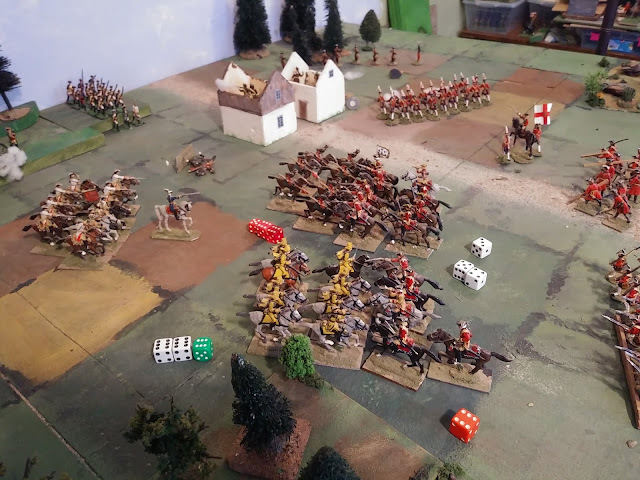 As the line reformed along the river, a stream of Blue riders burst through the clouds of smoke and threw themselves onto the remains of 'A' Company of the Highlanders. 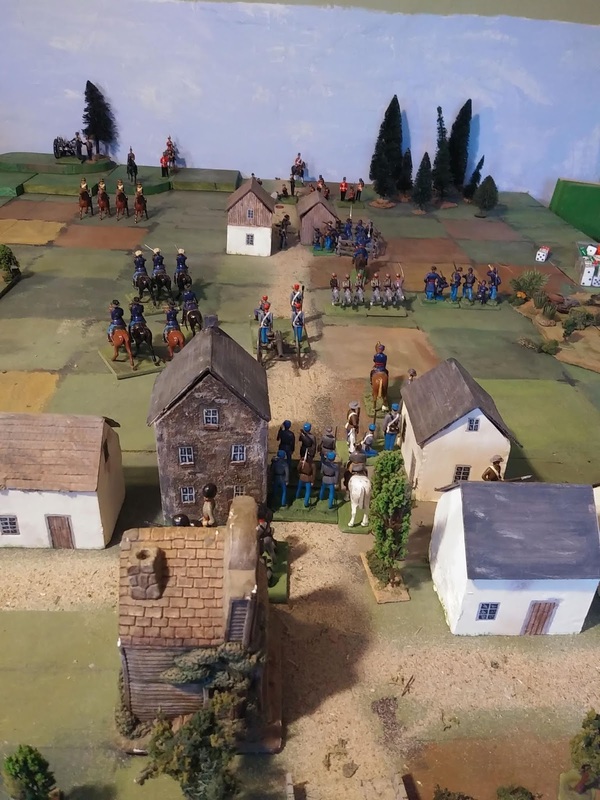 These steady veterans of many a fight, with MacDuff and Cu Mor at their head, held firm and unleashed a deadly last minute fire which sent the Blue riders reeling. 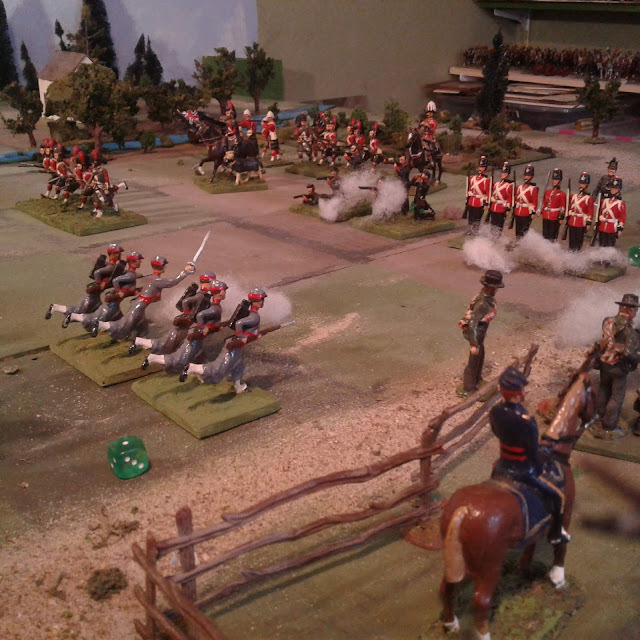 The repulse of the Rebel cavalry. 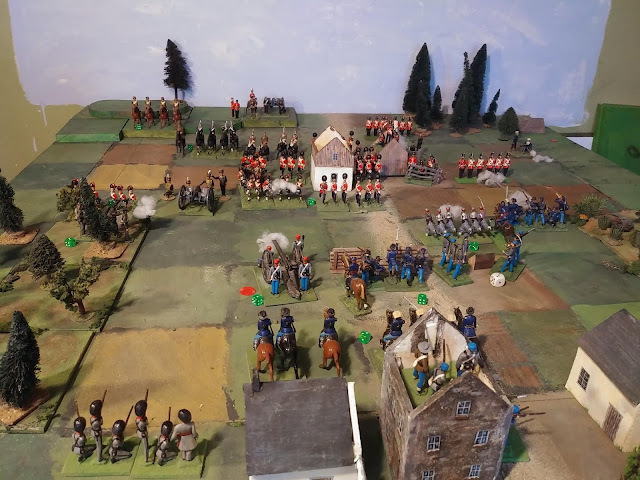 There is no doubting the courage of the Rebels though and the Horsemen rallied while the Grey Gunners redoubled their efforts and then, like an avalanche, they flung back the highlanders and were checked only by the arrival of the Governor General's own Horse Guards. 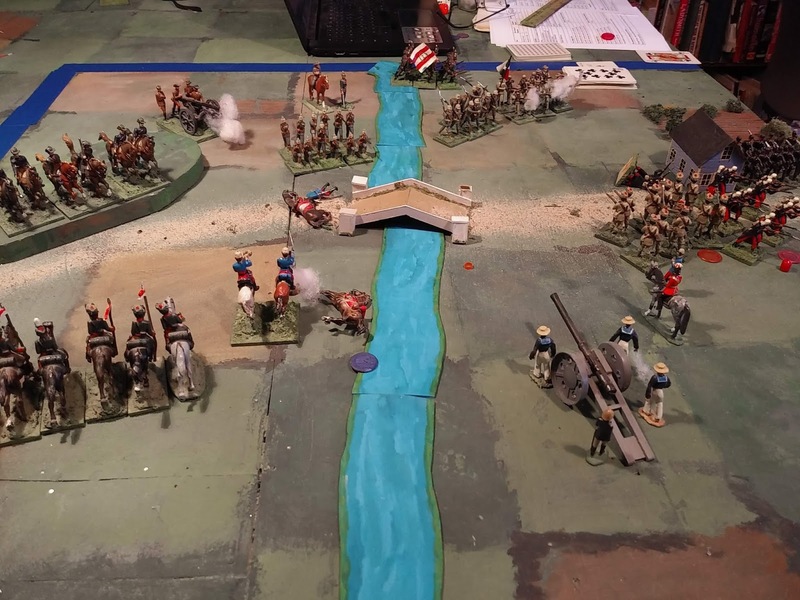 As dusk closed in, the Rebels launch one last desperate charge up the road in an attempt to take back the bridge but the Fusiliers held firm. 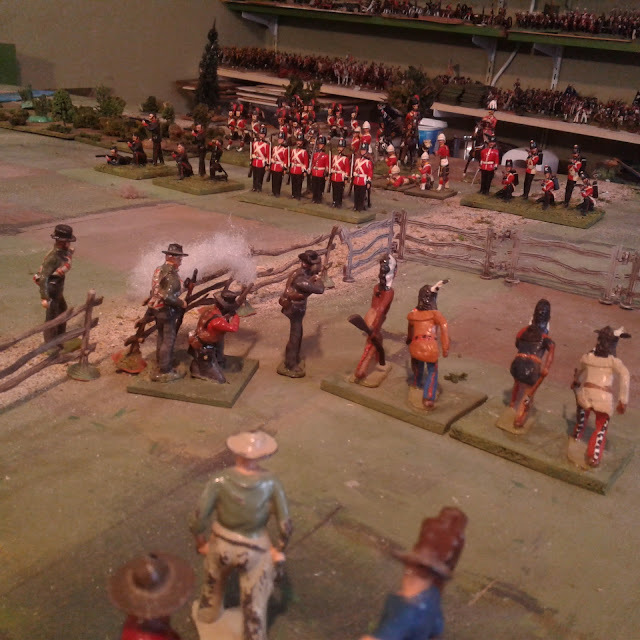 Gradually the firing died away as the Rebels fell back on the town. A truce was declared until morning while the wounded of both sides were collected for treatment and the dead laid to rest. The cries of the wounded were terrible. Ambulances and field hospitals are needed and if Her Majesty's government has no money then her subjects must raise the funds themselves. News of this great victory was swiftly sent back to the capital but it seems to me that we lost more heavily than the enemy and, despite our small bridgehead, we are in no shape to continue the advance until strong reinforcements are received. 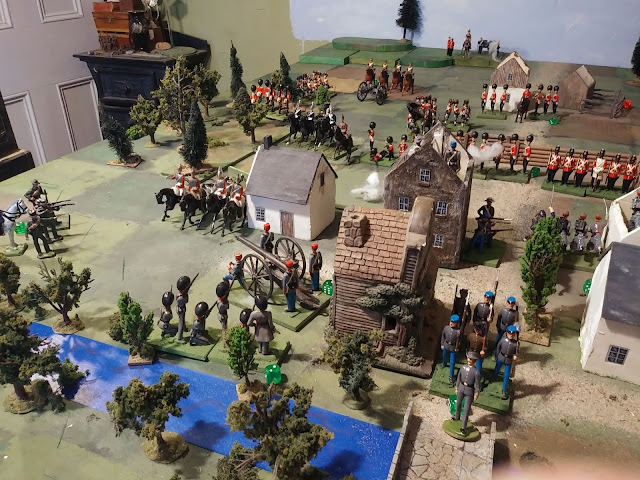 The enemy does not show any intention of retreating and if he entrenches or brings up reinforcements, well, it looks to this reporter like we might be better off back on the other side of the river behind our own entrenchments. The Winter Offensive has begun! Our Brave Volunteers assaulting a nest of Rebels! 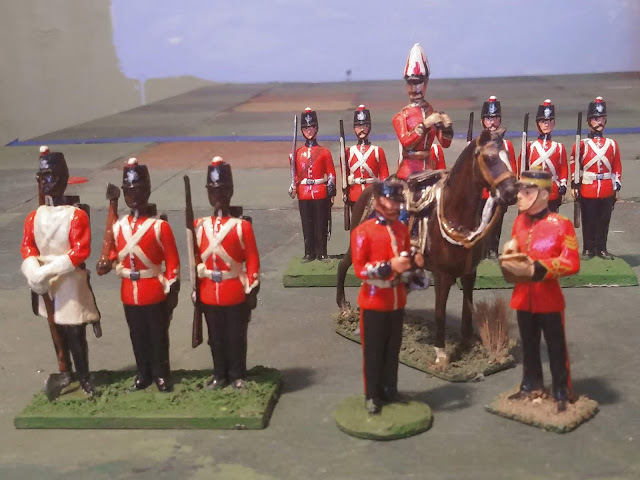 "After an all day march down dusty roads followed by a dawn march through a dark gloomy forest we broke out into the bright morning sun near Hyde's Corner. The men deployed smartly into the open fields under a hot fire from the enemy who must have been alerted to our approach. The surprise may not have been as complete as hoped for but the General has expressed every confidence in a victory that will lead the way to the suppression of this revolt. This dispatch will be followed by a full report when the battle is done and won." 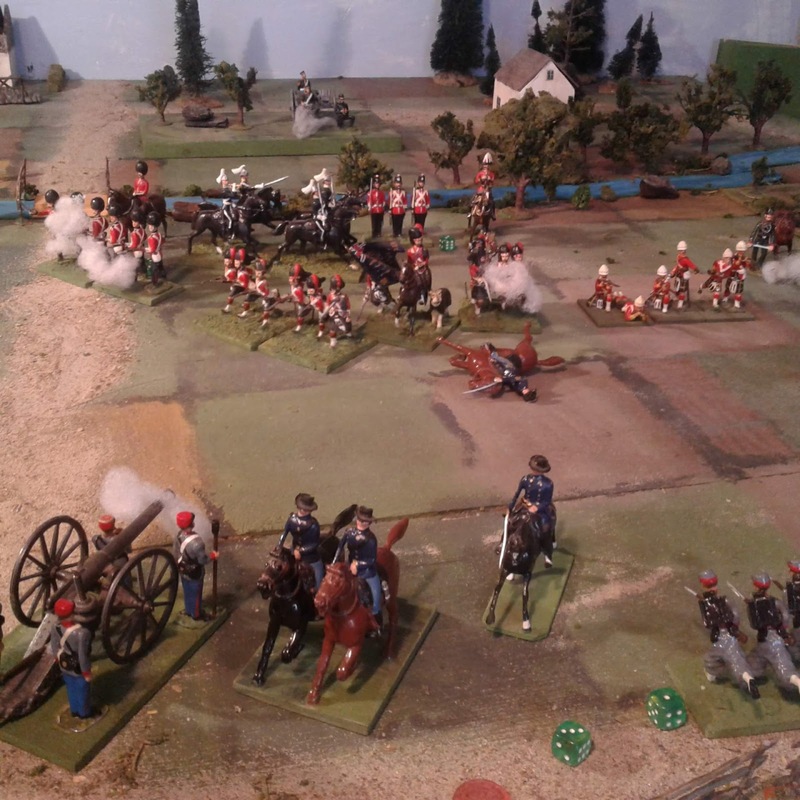 We hope to have an illustrated account of the battle in time for our Saturday morning edition. A Rebel picquet stands to at dawn as usual and watches for the enemy. All is quiet and so the men breathe a sigh of relief and look forward to their coffee and bacon. The scenario is drawn from the 'Battle to Battlegame' article in Issue 5 of Battlegames Magazine Issue 5, Nov/Dec 2006 (06?!?). The article, written by ...Me!, shows how the action at River Canard, the first fight of the War of 1812, could be the basis for a generic scenario. We'll see if/how it works for the Square Brigadier in the 1870's.